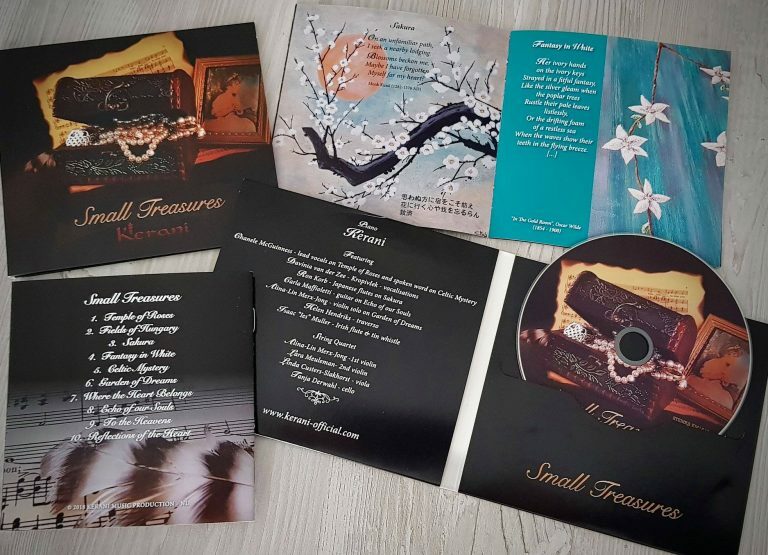 I am thrilled and excited to announce the release of my new album SMALL TREASURES. Recorded with a string quartet and a handful of carefully selected guest musicians, this is my most intimate and personal album ever. The albums that I released between 2011 and 2017 revolved around certain themes, such as frozen landscapes (Arctic Sunrise), female energy (Equilibrium), the wonders of the universe (Stardust), to name a few. For this album, I chose to write music that is closer to myself; music which describes memories and feelings that left an imprint on my heart. Among this collection of small treasures, there is a song that I wrote at the age of 14 and which has been orchestrated for the first time after all these years. Working on this piece was like a journey into the past, during which I relived some of my childhood sensations. ‘Where the Heart Belongs’ is a window to my youth. ‘To the Heavens’ was inspired by a poem of my mother in which she describes the two poplar trees that stood behind our house. I remember how she used to stand on the balcony silently watching the leaves rustle in the wind… I could tell you more stories, but I prefer to let my music speak for itself. ‘Small Treasures’ was recorded with a string quartet – all of whom are member of André Rieu’s Johann Strauss Orchestra – supplemented with a very select number of guest musicians, such as Grammy-nominated Canadian flutist Ron Korb, Irish singer-songwriter Chanele McGuinness, Dutch folk flutist Ies Muller, and Brazilian soprano coloratura and guitarist Carla Maffioletti. By featuring some of my favorite poetry and personally painted artwork in the album booklet, I hope to give a piece of myself to those who appreciate my music. 1. Temple of Roses – featuring Chanele McGuinness. This track was inspired by a poem by the American lyric poet Sara Teasdale who is known to evoke moods related to romantic love, the beauty of nature and death. The melody came to me immediately after the first reading. I decided that the music had to be subdued and mysterious, with a beautiful female voice that leads the way through the song. It is exquisitely interpreted by the talented Chanele McGuinness, a singer-songwriter from Ireland. 2. Fields of Hungary. With my paternal Hungarian background giving me a deep feeling of nostalgia, I wanted to describe this country. The endless fields of grain, sunflower and corn; the tasty food, wine and music; all these delicate flavors and scents and sounds are gathered in this classically-arranged piece. I used features that are typical of Hungarian folk music to try to give the listener a real feel of the country, and in the packaging, I included words of Hungary’s most famous poet Petofi Sandor which exactly express the way I feel about the country. On this tune and three others, Helen Hendriks plays concert flute. 3. Sakura – featuring Ron Korb. My love for the Japanese culture and traditions made me create this piece. Inspired by a 700-year-old renga (a genre of Japanese poetry) written by Monk Kusai, this song describes the beauty of the cherry blossom, which is the national flower of Japan. Grammy-nominated Canadian flutist Ron Korb is featured on Japanese flutes. 4. Fantasy in White. This is a light-hearted piano tune with a soft string accompaniment. It is based on a poem by Oscar Wilde in which he described his love for a beautiful woman who is playing the piano absentmindedly. In his fantasy, he compares her to flowers and other scenes in nature. 5. Celtic Mystery. This is a piece for piano and Irish flute describing the rugged beauty of the Celtic countries and the spirit of their ancestors. The words (recited by Chanele McGuinness) in this song are an invocation upon the spirit of Ireland by the druid Amairgin Gluingel, as he first set foot in Ireland. The bridge consists of ethereal vocalizations by Davinia Van der Zee, who also participated on Stardust. Isaac “les” Muller plays Irish flute. 6. Garden of Dreams. As expressed by poet Bliss Carman, everyone has a secret garden where they retreat every now and then, in order to find peace and calm and where they can replenish their souls. This dreamy piece, which has certain elements of Debussy, takes the listeners to their garden of dreams. 7. Where the Heart Belongs. This tune is a window to my youth. I wrote this song in at the age of 14 after having read a book about ancestry. This piece was never recorded or orchestrated until now. But I never forgot its melody. 8. Echo of our Souls – featuring Carla Maffioletti. Two lost souls have been searching for each other for what seems an eternity. When they finally meet, they not only discover how similar they are, but also how much they missed each other, although they had never met before. It’s as if they heard the echo of each other’s souls through space and time. This is evoked in a Kahlil Gibran poem. Musically presented as a delicate dialogue between me on piano and Brazilian Carla Maffioletti on guitar. 9. To the Heavens. After the passing of my mother, I came across a small collection of poems that she had written many years before. The poem I chose as a theme for this song describes two huge poplar trees that stood side by side in their garden. My mother used the trees as a metaphor for her own marriage: the closeness with her husband and the strength with which they survived difficult times with love, pride, and perseverance. 10. Reflections of the Heart. In his poem “Has My Heart Gone to Sleep?,” the Spanish poet Antonio Machado expresses his fear of running out of inspiration, but then decides not to give into foolish thought and that he must look into his heart and wait for a spark to light his imagination. We can apply this philosophy in our lives: instead of living and acting in fear, we should all open our hearts to life and absorb all the good that it has to offer. This feel-good composition is an excerpt of “Reflections,” originally a 27-minute long meditative track that appeared on my first album, Wings of Comfort. I decided to shorten the piece and re-orchestrate it for this album.